In re: Newspaper store relative to Marihuana in Springfield Press. 1 Pursuant to you’re your telegram of Mar. 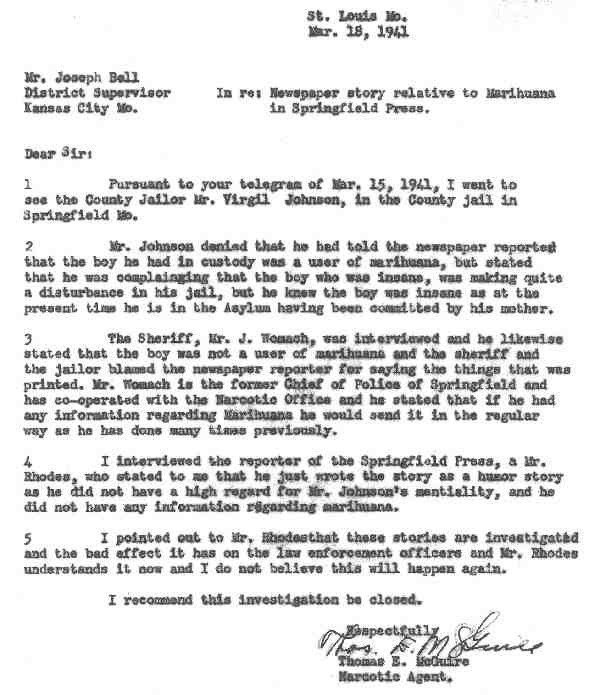 15, 1941, I went to see the County Jailor Mr. Virgil Johnson, in the county jail in Springfield Mo. 2 Mr. Johnson denied that he had told the newspaper reported that the boy he had in custody was a user of marihuana, but stated that he was complaining that the boy who was insane, was making quite a disturbance in his jail, but he know the boy was insane as at the present time he is in the Asylum having been committed by his mother. 3 The Sheriff, Mr. J. Womach, was mach, was interviewed and he likewise stated that the boy was not a user of marihuana and the sheriff and the Jailor blamed the newspaper reporter for saying the things that was printed. Mr. Womach is the former Chief of Police of Springfield and has co-operated with t Narcotic Office and he stated that if he had any information regarding Marihuana he would send it in the regular way as he has done many times previously. 4 I interviewed the reporter of the Springfield Press, a who stated to me that he just wrote the story as a humor story as he did not have a high regard for Mr. Johnson’s mentality, and he did not have any information regarding marihuana. 5 I pointed out to Mr. Rhodes that these stories are investigated and the bad affect it has on the law enforcement officers and Mr. Rhodes understands it now and I do not believe this will happen again. I recommend this investigation be closed. Thomas E. McGuire Narcotic Agent. 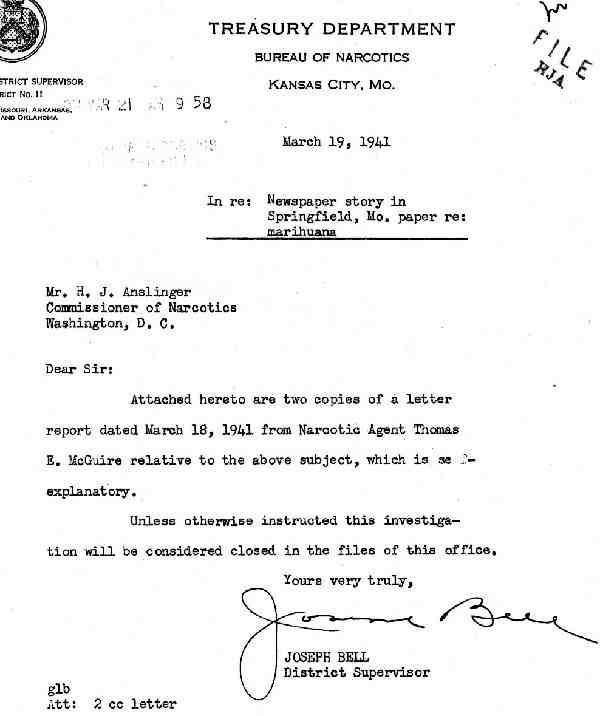 Attached hereto are two copies of a letter report dated March 18, 1941 from Narcotic Agent Thomas E. McGuire relative to the above subject, which is se explanatory. Unless otherwise instructed this investigation will be considered closed in the files of this office.